What another amazing turnout on Sunday for the third event of our Super Sprint Triathlon Series . It was pleasing to see women outnumber men on the start line, a real positive for our club! We again had a number of new members participate for the first time (welcome), as well as have some familiar faces make a reappearance (welcome back). A big thank you to RD James Geddes and his early morning helpers Phill & Jack Hatty for their efforts. A big thank you to rego regulars Gayle Viney and Alan Barrett and also to Billy Lynch & Stef Puszka who are getting rave reviews for their post race refreshment spread! Thanks also to those who jumped in and assisted on the day. We have brilliant volunteers we all appreciate their contribution to our events. If you haven't yet helped out, check the roster here for a vacancy and email your preferred date & position. If everyone goes on roster just once a year, all our positions will be covered. While we were making our way around beautiful East Point, Hannah Johnston, Jac Crofton and Corinne Fabian were battling the famous lava fields on the Big Island of Hawaii. Our hats off to our latest members to compete at Ironman World Championships and experience that magic Ali'i Drive finish line, awesome efforts all round! 1. Our juniors are looking forward to their swim bike run event this weekend at Lake Alexander. 2. Distances and formats to suit age & ability. 3. Start time 7:30am. Be early for registration and set up. 1. Entry for this event closes midday Friday 23 October 2015 to allow volunteers to confirm handicap start times for all participants and organise start groups. No late entry. 2. If you did not participate in one of the recent Super Sprint Series of events which will be used to calculate handicaps, don't worry, you can still enter. A start group will be allocated. 3. Unfortunately we have had a few people turning up late to registration. Please note check in closes at 6:45am. 4. Our registration volunteers are usually participants themselves so it is inconsiderate to expect them to cater to latecomers. 5. For those stragglers strolling in, no on time registration will = no race. Set your alarms five minutes earlier please. 1. Darwin City Council want your thoughts on community play space. 2. 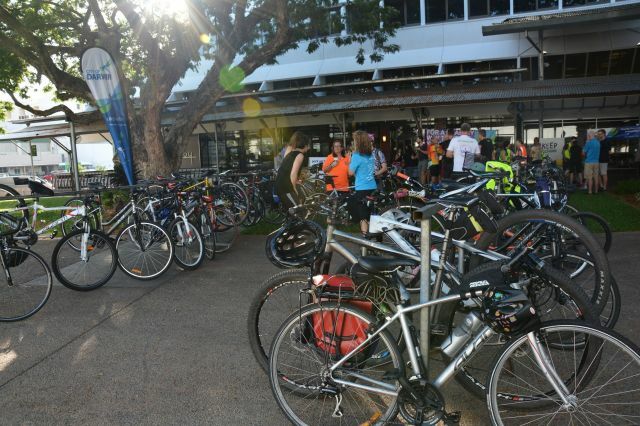 Did you ride to work for Ride2Work Day? You probably racked on our club racks if you attended the breakfast in town. 3. The Northern Territory Government is calling on us to share our views to help build a road map for the future of sport and recreation in the NT via "A shout out to Territorians". 4. On my tri dream list is a facility that has a swim basin (perhaps shared with rowing) surrounded by a crit track (share with cycling) and a run track and I'll be letting them know that. What's yours? 5. To give your views (and we would love you to use this chance to have NTG consider triathlon) please complete the online survey here . 6. We have John Thyne participating at Melbourne Marathon this weekend & Clare McVeity and Gary Wall lining up for the Half Marathon. Good luck! 7. Did you know you have a chance to win a Challenge Roth spot at Challenge Shepparton (15 Nov 15)? 8. Not familiar with Challenge Roth? Check out this video. 9. Our club is registered under the Ironman Triathlon Club program so do add Darwin Triathlon Club to your registration when you enter an Ironman or 70.3 event. 10. Thanks Emma Winterflood for retrieving one of our club signs inadvertently left on the bike course. 11. With all eyes turning to athlete tracking at Kona and the super effort being put in by Jac, Hannah & Corinne, people started to ask who, what, where & when and I was approached for some Kona "facts". As a bit of a club history buff and as records were very sketchy when I joined all those years ago, I've keep track of results since and also researched (as far as I'm able) historical info. I've had lots of interesting chats with Alan Stancombe, Ernie Koch, Brian Gallagher & Anthony Beven (to name a few) about club history and some members have also loaned me items of interest so I could copy and add to my personal collection. So since posting some info to our Facebook page at the weekend, I've checked further and come up with what I believe to be a list of our members who have competed at Kona. You can view that list here. Do keep in mind this list is of those who were DTC members at the time of competing. The pre 2000 results may or may not be complete. I would love to hear from anyone with any further info on Kona results. If you believe any result is incorrect please email so a correction can be made. Enjoy! 12. Huge congrats again to Hannah, Jac and Corinne on their results at the weekend and for conquering those Kona lava fields so well. We are all immensely proud & impressed, that you all - firstly qualified, secondly that you made it to the start line (a real feat in itself) and thirdly that you all proudly represented our club so well. Enjoy your recovery! 13. Lastly, it has been announced that IM Australia & IM 70.3 Port Macquarie will both be held on same date - 1 May 2016. 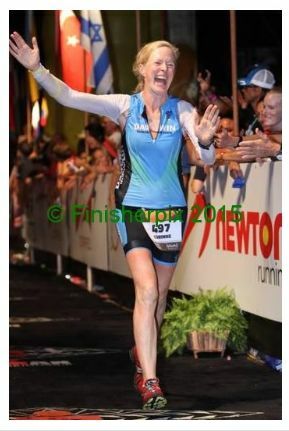 I think from that smile, it is fair to say Corinne was super excited & happy to reach the finish chute at Hawaii!